Beautiful Basel has a wonderful setting spreading out over both sides of the Rhine, stunning architecture, both old and new, an amazing collection of museums and art galleries and an historic Old Town which really knows how to celebrate Christmas. 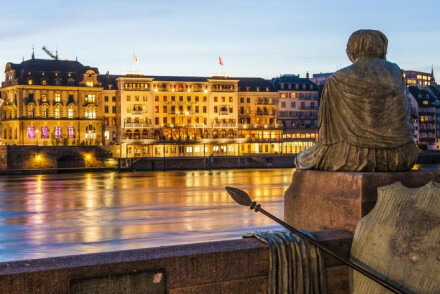 If you prefer your hotels old and elegant you’ll find many of the best places to stay in Basel are in the Old Town or Grossbasel on the south bank of the Rhine. 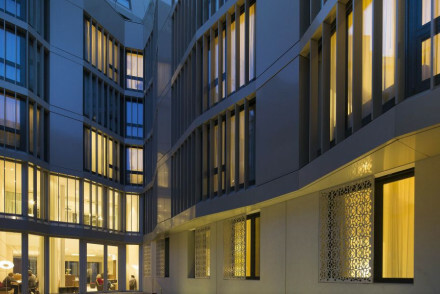 But if you like modern design then spread your net just a little wider and you’ll find some really special properties on our Guru’s list of the best hotels in Basel. The treasures of the Old Town include a Romanesque Münster, the Renaissance Rathaus, or Town Hall, the main market at Marktplatz and the remains of Grossbasel’s fortifications. 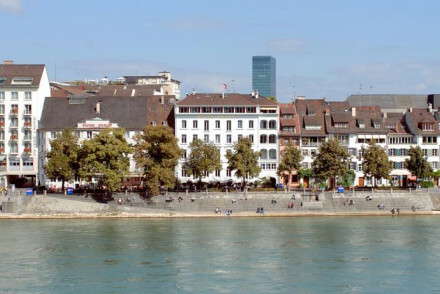 Basel is in the north-west corner of Switzerland, neighbouring Germany’s Black Forest and the Alsace region of France, as well as being close the the Jura Mountains, Zürich and Lucerne. Altstadt Grossbasel, the city's Old Town, is ideal for those wanting to see all the sights and be surrounded by beautiful architecture. Altstadt Kleinbasel, located just across the river from the Old Town, is full of buzzing squares, bars and restaurants. There's definitely a distinctly Mediterranean feel to the place (for all the right reasons!). Gundeldingen is located slightly further out, and so is a fairly cheap place to stay. It's still a great spot - featuring a wide variety of cultural influences which are most reflected in the diverse array of eateries dotted around. If you're here for the art then it's hard to know where to start. The Kunstmuseum is an obvious choice, and it’s probably worth visiting the Museum Jean Tinguely, because it’s so unusual, the Vitra Design Museum and, at the opposite end of the scale the Antikenmuseaum Basel, the Foundation Beyeler and the Schaulager. Baseul Münster, complete with red sandstone walls, colourful roof tiles and an imposing structure, is one of the city's most unforgettable landmarks. Its main rival for that title would have to be the Rathaus (or Town Hall). This stunning 500-year old building has maintianed its vibrant red exterior throughout all these years, with striking pieces of artwork also adorning the outside walls. Plus, it's totally free to go inside and have a look around! Don't forget that this city is busy especially around Christmas market time, and when the various fairs and festivals are on. 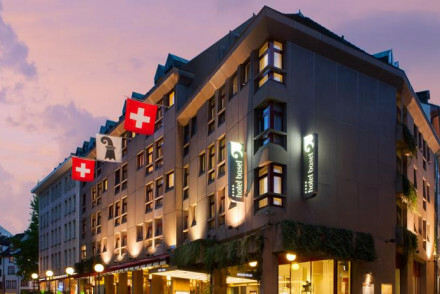 Be warned, if you want to book a room in one of the best places to stay in Basel during any of these periods, you'll need to be organised and plan well ahead. The Passage has a great location on the boudary of the the Old Town and the new city. The design is quite something, there are contemporary murals in chic rooms - but otherwise it’s all white on white. There’s a courtyard bar where they also serve breakfast, plus a large gym and sauna. The Hotel Basel also has a great location, this time in the heart of the old town, but the decor is very contemporary - expect white walls and the odd bright feature wall. There’s a gourmet restaurant. Der Teufelhof is a trendy art hotel with 33 rooms, which are decorated by different artists every five years, and two restaurants, one with a Michelin star. There’s also an in-house theatre and bar. If you like slick, minimalist design then Hotel D is for you. Right in the centre of town, the Hotel D has 48 large, contemporary bedrooms and wonderful city views. There’s also a sauna and gym, and it’s all environmentally friendly. The Grand Hotel Les Trois Rois is a spectacular riverside hotel dating back to 1681. Traditional, of course, it has 101 individually designed rooms decorated with antiques and warm colours. Some rooms have huge windows overlooking the river. Plus there’s a restaurant with three Michelin stars and a very elegant bar. Krafft has been converted from a historic building in an amazing location, right on the Rhine. The conversion is quite Scandi in style, with light, airy rooms and parquet floors. There’s an elegant restaurant serving gourmet food, plus you’re close to the historic part of town. Basel Youth Hostel isn’t just for the young, this hotel has 66 chic, minimalist rooms - some dorms and some with their own private bathrooms and huge windows overlooking the Rhine. There’s a games room, bicycles and the restaurant offers four course dinners. Great for families too. If you'd prefer the flexibility of a self-catering option then browse through the wide variety available online with our partner, Booking.com. Basel is a year round destination, but if you want warm weather then you should visit in the summer months, with the average temperature climbing to 20°C in July. This however is peak tourist season, so for a quieter and cheaper alternative consider coming in the shoulder season months (May and October). If you're coming from abroad then you should fly into EuroAirport Basel Mulhouse Freiburg, located 3.5km north of the city. If you'd like the freedom of having a car with you then check out the selection available with our partner, Rentalcars. 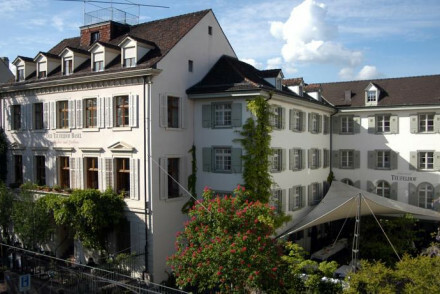 Still not sure which is the best place to stay in Basel for you? Browse through our list of all the best places to stay in Basel. Widen the net to search through our list of the best places to stay in Zurich. Chic, designer building offers minimalist rooms or dorms on the banks of the Rhine. Contemporary rooms have huge windows, some with private bathrooms and plenty of space. Games room, bicycles and the restaurant offers 4-course dinners. A very stylish base, ideal for families or groups. A slick minimalist eco hotel, in the heart of Basel. Smart rooms feature all the necessary mod cons, large contemporary bathrooms and wonderful city views. A sauna and gym are ideal for unwinding after a day sightseeing. A great spot for business stays or local exploring. 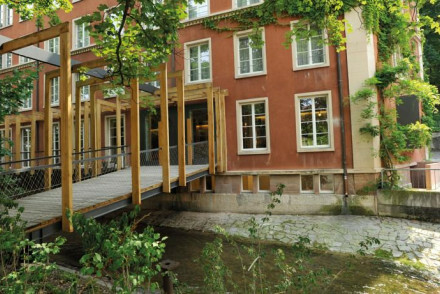 City Style - An eco 4 star hotel with wonderfully modern interiors and excellent views of the Old Town and the Rhine River. Business meetings - A centrally located hotel offering a modern and well equipped business centre. Sights nearby - Visit the historic Basler Münster that dominates Basel's cityscape. Stroll through Basel Old Town, one of Europe's prettiest. Local markets - Wander through the food stalls in the Marketplatz and pick up some regional treats. A contemporary hotel in the heart of Basel. Chic rooms, with contemporary murals, are otherwise white on white. A courtyard bar and breakfasts served. There is a large gym and sauna plus a meeting room. Walking distance from many of the cities sights. Ideal for business or pleasure. 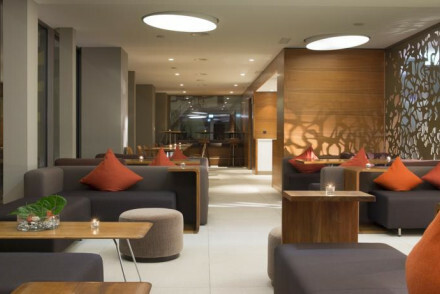 City Style - A chic modern hotel on the edge of Basel's Old Town. Local exploring - Within easy access of most of Basel's best sights. Local markets - Just 5 minutes from the Marketplatz where a local food market is held. Sights nearby - Make a trip to the impressive Basler Münster (cathedral). Set in the heart of the old town yet with uber contemporary interiors. White washed rooms are brightened with a brightly coloured feature wall. Gourmet cuisine served up in all of the three restaurants. Walking distance from many of the city's sights. A slick hotel ideal for exploring the city from. Local exploring - A contemporary hotel, well located in the heart of Basel’s old city and within easy access of many of the city's sights. Local markets - Wander through the quaint food market in the nearby Marktplatz. Great walks - Take a walk through the fascinating Basel Old Town. Sights nearby - Visit the imposing Basler Münster (cathedral). A trendy art inspired hotel situated in the heart of the Old Town. Creative 'art rooms' are decorated by artists every five years. Two restaurants, one of which, holds a Michelin Star. An in-house theatre and hip bar. An idiosyncratic luxury hotel that won't disappoint. Local exploring - Situated in the Old Town and within walking distance of many of Basel's sights. Foodies - The Bel Etage restaurant has been awarded a Michelin Star. Sights nearby - Visit the Basler Münster that dominates the cityscape. Great walks - Wander through Basel's pretty Old Town. Situated overlooking the Rhine. A historic building with Scandi-chic contemporary interiors. Light and airy rooms with parquet floors and white washed walls. Glorious contemporary bathrooms. Gourmet food in the elegant restaurant. Close to many of the cities sights. A stylish option. City Style - Well positioned in the historical part of the city with wonderful views over The Rhine. Sights nearby - Right next to the hotel is the historic “middle bridge”. A spectacular riverside hotel steeped in history, dating back to 1681. Unashamedly traditional in design. Individually designed rooms feature large sash windows, warm hues and antique furniture. Housing a three star Michelin restaurant and elegant bar. A Basel institution and a spoiling stay. Foodies - The Cheval Blanc has been awarded three Michelin Stars. City Style - Traditional, elegant and unequivocally impressive.